Colors: Red, fawn, white, black, blue, brindle or any of these colors with white. It is an old breed of dog which enjoys being the 5th most popular breed in its country of origin, the United Kingdom and is associated to the bull terrier. 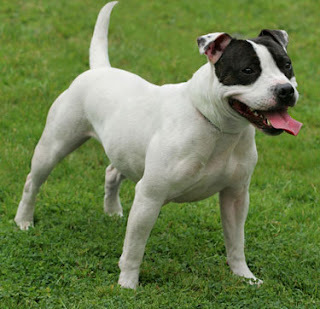 Being a descendant of dog-fighting ancestor, it shows great strength and bravery. However, the modern breeds fail to show stability and affinity for the people. It is a medium-sized dog similar in appearance to that of the American Staffordshire terrier and American pit bull terriers and possesses great athletic powers. They occur in a variety of colors as already mentioned above. The characteristic of having a white dog with any other color over the body is known as pied. Even though liver-colored and back and tan dogs do exist, they are quite rare and are not very popular because of the belief that a different terrier is mixed to get the color. The coat is smooth and gives a streamlined appearance. Temperament may vary in the breed but common traits do exist. They are known for their bravery, intelligence and loving. Moreover, they are affectionate towards their friends, quite and trustworthy. Hence, they make an all-purpose dog. Owing to its muscular look, it appears quite frightening but in reality they are not at all suitable to be guard or attack-dog because of their love for people. The puppies must be wormed at two to three weeks at least thrice before they go to their new homes. This dog breed has a life expectancy of about 10-16 years. Although, they are generally a healthy breed, careless breeding can cause hereditary genetic flaws. This may result in L-2-hydroxyglutaric aciduria and Hereditary Cataracts. Moreover, they can suffer from distichiasis, Persistent Hyperplastic Primary Vitreous and mastocytoma.